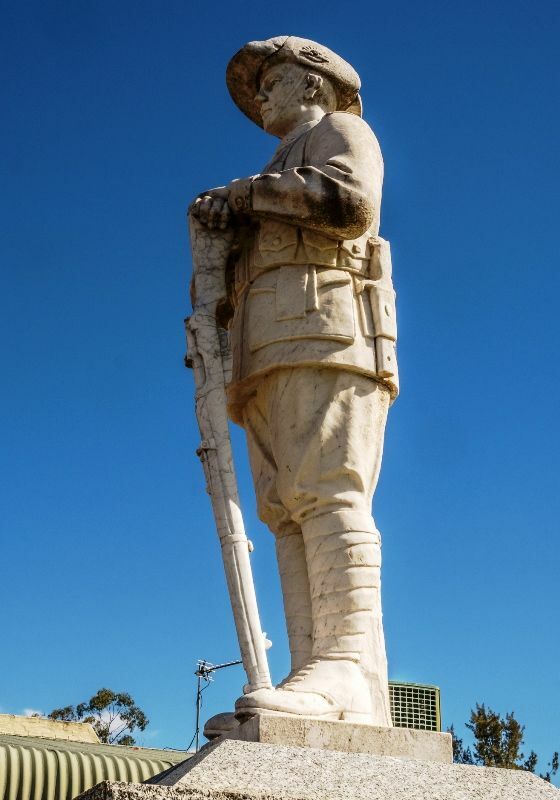 A monument commemorates those from the Grahamstown and Shepardstown district who served in World War One. The monument was originally unveiled in the Shepardstown School Grounds and contains the names of former scholars of the school who served in World War One. A plaque on the memorial states the memorial was originally unveiled on the 27th August 1921. Information from Trove articles states the memorial was unveiled on the 4th September 1921. The statue was placed on the memorial and unveiled on the 3rd September 1922. 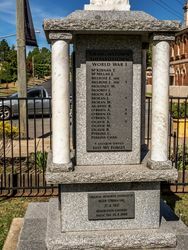 The monument has been relocated and the restoration was unveiled on Anzac Day 2008. 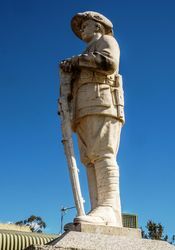 White marble statue of an Australian soldier, standing on a granite pedestal with 4 white marble columns. Soldiers names are engraved into dark grey granite and higlighted in black. GRAHAMSTOWN. UNVEILING OF WAR MEMORIAL. A perfect spring day greeted the large crowd that assembled round the beautiful memorial in the Shepardstown School ground to see the final unveiling on Sunday afternoon. Three o'clock was the time fixed for the ceremony, and, from 1 p.m. until the appointed hour and after, cars, sulkies and crowds on foot continued to arrive until the space for some distance round the veiled memorial was crowded. The Chairman, in introducing Mr. O'Brien, who was to perform the ceremony of unveiling the memorial, gave a brief outline of the movement since its inauguration, and then invited Mr. O'Brien to unveil the memorial.